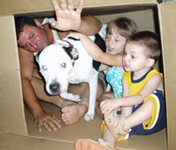 Welcome to the Pet Adoption League of Lower Westchester County, NY (PAL). We are an all volunteer, non-profit 501(c)3 Charity that works to help animals in need. 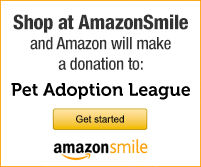 The Pet Adoption League (PAL) is a non-profit 501c3 charity that works to find loving and permanent homes for adoptable dogs and cats. 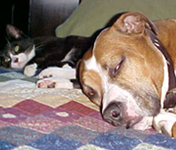 In 1996 the volunteers that would become the Pet Adoption League, were instrumental in changing a local City Animal Shelter's kill rate of 67% to a more humane facility with a euthanasia rate of only 10-12% through 2007. Ready to give a well-deserved cat or dog the home he/she deserves? Rescue a local animal here. Whether you are looking to adopt, or would like to volunteer or donate, feel free to reach out to us. Donations are used for spay and neuter, food for cats, and veterinary care for the sickest and most injured animals. Learn about options and resources for current pet owners and families who want to consider adoption. “Petunia’s” face says it all – I am Loved This beautiful kitten, a blue crème calico’s look on her face is the most reward we at Pet Adoption League could ask for Little Petunia was trapped living outside with her brother and at only 8 weeks old! It took a few weeks for her to learn to trust humans but here is she is happily with her new feline brother “Okie”. Eric and Jackie cannot get over how affectionate this little beauty is and as you can see he has made “Okie’s” world. Her own brother also got a wonderful home with a young couple and his own feline companion. Great News! 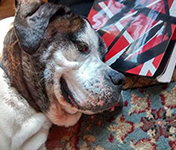 Remember our wonderful Mastiff senior “Massive”? A lot of good news on “Massive”. He did survive his surgery, not easy with his age and size. Wonderful Dr. Richard Jakimer of Manor Veterinary Hospital did his surgery and the truth is we would not have trusted “Massive” with any other vet. We knew if “Doc” after doing countless tests felt that “Massive” would survive surgery we could do it. And best news – the tumor was begnin. Can you hope or dream of even more good news. Well “Massive’s” angels came through for him again.A wonderful family in Eastchester saw him on Facebook and came to meet this lovable giant. He was adopted about 2 months ago and is doing wonderful. He is gentle and loving with everyone and this photo says it all. You can see the BIG Smile on his face. It truly was a group effort to Save “Massive”. From the Volunteers at the Yonkers Shelter, Pet Adoption League, Dr. Richard Jakimer and of course YOU… All of you who donated to fund his medical care. Without you we could not have done it. Thank you! 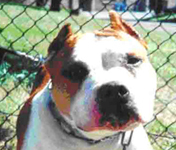 Brownie was found as a stray by the Metro North train station in Yonkers in March 2005. No ID nothing for this young brown Pit Bull / All American Mixed Breed. He had no life threatening wounds, did not seem abused. Just a plain brown dog, maybe a little too active but like so many that are dumped and forgotten. So at firsthis rescue and second chance may not seem extraordinary…but to wait 7 years in an old animal shelter for his savior to come is an amazing story in itself. It’s a testament to the resiliency of Brownie, and most certainly to the volunteers that never gave up on him. Getting him the training he needed so he would walk well ona leash, keeping him socialized and most important giving him love so HE never gave up. No one should die because they are thought of as just plain looking.And while he got plenty of affection and exercise and training sessions to keep him happy a shelter is nowhere to live your life and it’s not a home. In May 2012 Brownie’s savior came. Through a network of sharing on facebook which is run by two other volunteers, a lady in Washington DC read his story and opened her heart to him. 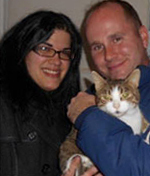 On May 5, 2012 Pet Adoption League volunteers drove Brownie to meet Amy half way between Washington DC and Yonkers. We call that his “freedom ride”. He is finally home. He goes for walks along the Potomac River and has become a true ambassador in sorts that forgotten long term animal shelterpets deserve a chance. Truly a story of the dog NO ONE wanted. Always passed over, but we never gave up and neither did Brownie (now Shanti). 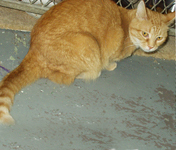 Leo was given up due to his human's circumstances changing. Always going away on business and then having to move, it was decided that it would be in Leo"s best interest to be re-homed. He went from living in a kitchen with having little interaction with others , to living in a house with a new mom and baby brother and getting all the attention he so desperately craves. He is such a happy boy now and wants to be friends with everyone. If a dog is nasty to him he doesn't understand why, and will continue to try and be friends. The first day in his new home, after play time, time was spent on the couch watching cartoons while mom and baby brother took a nap upstairs. He loves everyone and is thrilled that the neighborhood is filled with people that walk their canine kids frequently. The stray Momma cat who saved 23 kittens finds her own home! Pet Adoption League Members volunteer at the Yonkers Animal Shelter and many of our foster cats and kittens come from there. Sookie came to the shelter with her 7 kittens in early spring of this year. As are most shelters they were packed with kittens of various ages, a lot of them not old enough to eat on their own. As Sookies kittens learned to eat solid food staff would introduce the bottle babies to Sookie, she never turned them away. Sookie kept nursing more and more stray bottle babies as the weeks went on until she was physically depleted and emaciated. We stepped in and took Sookie home with her last adopted litter of 5 kittens. The kittens were restless and crying all the time. Sookie was nursing them but the kittens were not satisfied, she had finally run out of milk. For several weeks we bottle fed the kittens ourselves until they could eat solid food. During that time Sookie got a much needed break. She ate 5 cans of cat food per day plus bowls of dry cat food, it took several months but Sookie was finally at a healthy weight. 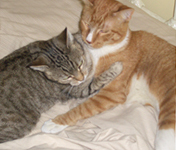 We estimate that Sookie saved at least 23 kittens lives by nursing and taking care of them. And Christmas Miracles do happen. Sookie after her health was better began going with us to adoption events at PetCo. A lovelycouple saw her and have adopted her. They will be picking her up right before Christmas as they will be moved to their new home by then. You can see them here visiting Sookie at volunteers / foster parents Maureen and Chris’ home, so she knows they are coming for her. As a kitten "Boo baby" was thrown out a window. Her pelvis was severly shattered and the vets said there was nothing to do but keep her quiet and see how well she would heal. 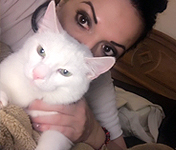 After many vet visits and x-rays from Pet Adoption League, she was begining to heal but very depressed in her cage at the shelter....along came Jacquie who wanted to adopt a kitten. Boo and her eyes met and it was like two kindred sould connecting. Jacquie was advised that Boo Baby may never walk 100% again. She did not care, she said she could not leave her behind in that cage...so Boo Baby went home on a foster basis so Jacquie would help her finish healing.....OF course foster turned into forever home......If not for Jacquie, Boo Baby may not have made it. Roxy the cat was rescued from the streets of Mt. Vernon. She was in bad shape and in need of some love and care. 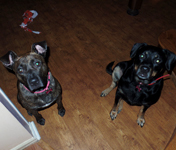 Through PAL she found a forever home where she is loved by her human companions and by her new friend Ruby. She has recovered from her difficult times on the streets and is so happy that someone cared enough to help her. Such a happy tail! St. Peter is SO happy in his new home. He knows where treats are and asks for them by putting his paw under the door. He relaxes belly up his mom says. His mom also said he's an angel! Of course, we knew that!!!! He has found the perfect forever home where he is loved by the whole family, including the grandchildren, who hide toys for him to find. Sylvester (formerly known as Benji) was rescued form the mean streets of Mt. Vernon. He had all four paws declawed, so he had obviously been previously owned, but sadly had been living on the streets. After Sylvester received some help from Just Strays, a generous foster parent, and PAL, he found the perfect home, and his new best friend. 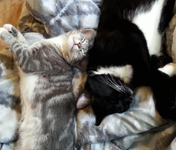 Sylvester is now in his forever home where he, his new parents, and his new bunk mate have all found a perfect fit together. Tiger had "issues." His owner had died, and Tiger was brought to a shelter. It was a shock that our beautiful orange Tiger never recovered from. He hated life at the shelter, and struck out at anyone who came near. We began to wonder if he could ever be placed in a home. But we also noticed that our unpredictable Tiger behaved himself whenever he went to the vet's. Was Tiger a fabulous cat in disguise, just desperate to get out of the shelter? We began to hope, and allowed ourselves to fantasize about his perfect home: a single person, a cozy apartment, no other pets, and a work schedule that left time for Tiger. Guess what? A single man, a grade school teacher, walked in one weekend. He wanted to adopt a cat - perhaps a cat that we were having trouble placing. He met Tiger . . . who promptly gave him some impressive scratches. Despite this the man agreed that Tiger would probably relax in a home of his own. It was a gamble, but one with a big pay-off. Now Tiger is happy in his new home, and has become the contented and friendly cat we knew he could be! 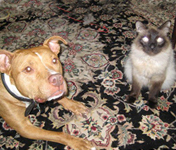 "Speedy" the cat, (adopted from PAL) had a face to face meeting with Lucy on Friday afternoon. Lucy is my pitbull/boxer. I adopted her from CACC in 2001 when she was about 2 months old. She is 60 pounds and 6 years old. The dog and cat were kept separated for 6 days. At first their was much excitment on the dogs part she was kind of rough pushing with her snout, pawing and sniffing really hard on the cat - but that's about it. No snarling or growling. The morning after their initial meeting, the cat was drinking water from the dogs bowl - the dog just sat there. Yesterday, the cat was sleeping in the dogs bed and I figured - that's it, they're comfortable together. A purrrrrfect match. Willow was beautiful when she first came to the shelter. 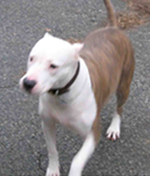 A lovely, white and brown American Bull Terrier mix, we thought this sweet young stray would be adopted in no time . . . as soon as we could get her spayed. But Willow left for a veterinarian's office one morning and returned a medical disaster due to a botched spay-job: within a half hour of her return to the shelter, her incision split open and her intestines spilled partially out of her body. Luckily for Willow an alert kennel worker, Danta Williams, was checking up on her and saw blood all over her kennel. Heroic efforts were made and her life was saved . . . But poor Willow's nightmare was not over. When that same vet returned Willow to the shelter after tending to this emergency, he failed to inform us of the severe trauma to her body or tell us of the special care she needed. Within hours it was apparent she could not get her fill of water, could not hold water down, and could not eat except for very small quantities. Our formerly healthy, vibrant young girl began starving to death. 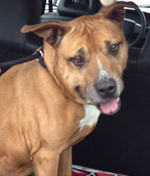 A PAL volunteer took Willow home, where her condition improved briefly but then deteriorated. Willow was rushed to a different vet, who held out some hope for her. 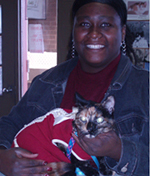 That vet, Dr. Jakimer at Manor Veterinary Hospital, was her savior. He immediately diagnosed what had happened to her from the botched surgery. After treatment Willow went back to PAL foster care, where she was on a variety of medications and was able to keep small amounts of food down when fed every couple of hours. Twice more we almost lost her, but this girl wanted to live, and knew how much we loved her and were rooting for her. After several months, and countless vet bills, her energy returned and she began to act like a young, healthy dog again. One of Willow's unique talents was mimicing the barks and cries of the other dogs she was living with. 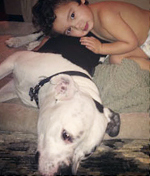 She became a joy to her foster "Mom", but everyone knew Willow deserved a home of her own. We worried about finding someone willing to adopt a dog that would need a her diet monitored for the rest of her life . . . but Willow's gentle spirit and clownish antics won over that one person that was meant to be hers. She is now in a wonderful permanent home, with a "sister" dachshund and a loving person, who both adore her. Wendy was . . . well, wild. 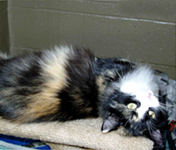 This comical, adorable 8-month old long-haired tortoiseshell was quite a character! She flew around our cat room, brandishing her bushy 2/3 tail with confidence. But as cute as she was, she was tough to place, because despite her wild streak she was very shy at first meetings. She relaxed considerably at the shelter after a few months, and became comfortable around people she knew. It took time to find her just the right home, but PAL was on the case. When a couple who called specifically to meet Wendy came to visit, she sized them up immediately and knew she was the one for them. They took her home that day, and they report that Wendy has proven to be the wonderful sweet loving gal we all knew was there, hidden under that gorgeous coat of hers! For eight years, Roxy was a very even-tempered, affectionate, devoted companion, who lived with an autistic child whom she adored. But her human broke her heart when he returned home from fighting in Iraq, sold the house and moved into an apartment that did not allow dogs. Even though Roxy was the perfect dog, he abandoned her instead of finding a housing situation that would permit them to stay together. We knew that finding a home for an eight year old dog would not be easy. But we also knew that no matter what, we would find her a loving, permanent home with someone who really appreciated her. PAL received a call from a couple interested in adopting a dog to be a companion for their elderly Shepherd and two small children. They had recently lost a dog to illness, and their Shepherd was very depressed. They thought they had a problem, though, because the Shepherd did not seem to like other dogs and would bark loudly at them. But a PAL volunteer explained that Shepherds just like to talk and it doesn't always mean they don't like the other dog. PAL had a couple of dogs that were a possible match, including Roxy, and one of our volunteers drove almost two hours to introduce them to the couple's Shepherd. 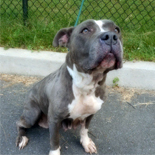 The people had expressed some concern about Roxy having some pit bull in her, but agreed to meet her nonetheless. And what a good thing they did: when Roxy got out of the van she immediately greeted the family by lying down and rolling on her back. They saw right away what a lovely mush she was, and she has been the perfect addition to their family! One of PAL's guiding principles is that an animal is assessed on its temperament, not on its breed, background or the circumstances by which it came to us. We do not do 'breed profiling' or judge certain breeds of dogs unadoptable. Face, found tied to the shelter door one morning, is a case in point. He is a big, purebred American Bull Terrier - yep, 'pit bull' is written all over this Face! Yet from the first he was the perfect gentleman, responsive and affectionate to everyone he met. But how to get him adopted? 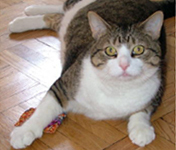 He was at least 6 years old and, frankly, his imposing size frightened most potential adopters away. PAL never gave up on him, though! We trotted him out at every opportunity, took him to adoption days and plastered his photo around town. Finally, someone saw that Face in a photo and came to take him home - now Face is giving and receiving love in equal measure in a happy home of his own. We wouldn't settle for anything less! Copyright 2017 Pet Adoption League, Inc.